What are the principal factors that cause hair loss? There are a host of factors that influence hair growth and cause hair loss. The #1 reason for hair loss for both men and women is heredity or genetics. For women, hormonal changes, stress, changes in diet or a lack of nutrients, over-styling with hot tools, extensions or weaves, medical or health issues and aging are all factors that can trigger hair loss, and make it worse. Hair loss and hair regrowth differ by individual. Hair grows from a specialized sac in the skin called a follicle. There are three distinct phases of the hair growth cycle. • The Anagen phase is an active growing phase. It lasts for up to two to seven years. About 85% - 90% of the hair on your head is found in this phase at any given time. • The Catagen phase is a transitional phase that typically lasts for approximately two to four weeks. During this transition stage, the hair follicle begins to shrink. • The Telogen phase is considered a resting phase and it lasts about two to three months. During this stage, as the existing hair is in a resting state, a new hair enters the Anagen cycle and begins its growth. As a new hair grows, the old hair is shed which is sometimes referred to as Exogen. It is normal to lose about 50 to 100 hairs per day. How common is hair thinning or loss in women? It’s extremely common, and likely more prevalent than you think. According to a recent survey of adult women in the US, approximately 56 million women in America or more than one in three adult women, are experiencing hair thinning or loss. More than 50% of women will likely experience this issue once they hit the age of 59. What are the options for women? If the hair loss is severe, and surgical treatment is considered, those options are limited. While 95% of men are good candidates for hair transplants, fewer than 5% of women qualify for transplants. Injections can be an option but are painful and expensive. The best course of action is prevention and treatment, such as using the Keranique® Hair Regrowth System for Women. It’s important to address early for the best results. How do I know if I am experiencing normal hair loss, or something more? There are approximately 100,000 to 150,000 hairs on the average human head. You lose, on average, approximately 50 -100 hairs per day. If you find you are losing more than this, and have been for an extended period, you should consider identifying the cause by talking to your doctor or dermatologist, and then using a solution-based approach to stop the loss and maintain the hair you still have in good condition. The Keranique Hair Regrowth System can help. How is women’s hair loss different than men’s hair loss? Women don’t lose hair the same way men do. Men normally experience predictable male pattern baldness; when hair thins for women, it generally thins in a diffuse pattern all over the head or in patches or visible as a widening of the part. Women wear their hair longer in most cases and so it’s easier to hide loss and thinning. However, this makes determining loss more difficult and as a result, treatment is often delayed. By the time it’s noticeable, up to 50% of hair may already be lost. What is the Keranique® Hair Regrowth System? Keranique® is your advanced solution for thinning, flat, lifeless hair or if you are experiencing hair loss. Created specifically for women, these products deliver outstanding results for ladies of all ages and with all hair types. The Keranique® Regrowth System follows a simple three step process: 1) Cleanse & Condition, 2) Treat and 3) Protect & Style. How do I use the Keranique® Hair Regrowth System? Cleanse with Scalp Stimulating Shampoo. For deep hair cleansing, the Scalp Stimulating Shampoo offers you everything you need. Many women suffer from thin or thinning hair simply because their hair follicles are clogged with oils and debris. When pores on the scalp get blocked by excess product or natural buildup, your follicles will have trouble producing healthy hair. With Keranique’s vitamin-enriched and antioxidant-infused shampoo, your scalp will never feel cleaner. Keranique® is formulated to deep clean not only your hair itself, but also the roots and follicles which produce new, healthy hair. So it takes care of your hair and scalp at the same time. A healthy scalp means healthier hair supported by out Keratin Amino Complex™. Gently massage into the scalp and through hair from roots to ends and leave on for 3 full minutes for optimum results. Condition with Volumizing Keratin Conditioner: After your hair is clean, it must also remain protected and fortified throughout the day. The Volumizing Keratin Conditioner is enriched with a hydrolyzed keratin compound. This creates a barrier between your hair and the environment. Keranique’s Volumizing Keratin Conditioner also helps protect hair against problems like humidity, heat, and moisture affecting your hair and adds strength and volume with our Keratin Amino Complex™. Distribute from roots to ends and leave on for a 3 full minutes for best results. Step 2: Treat with the Treatment for Hair Regrowth: The treatment stage of Keranique® can vary based on your individual needs. For women with thinning hair who are looking for regrowth, this will produce the best results. This kit includes the Keranique Hair Regrowth Treatment with 2 % Minoxidil, and is specially formulated with the only pharmaceutical-grade, FDA approved Hair Regrowth Ingredient, made for a woman’s biochemistry. Apply directly onto scalp in problem areas twice a day, morning and night, on dry or damp towel dried hair. Step 3: Protect & Style with the Lift & Repair Treatment Spray: Keranique Lift & Repair Treatment Spray is a true treatment product that also adds volume, lift and style to your hair. This unique multi-benefit spray infuses hair with our Keratin Amino Complex™, wrapping around each strand, helping to mend damage, smooth frizz, restore shine and create an invisible support system for touchable volume. Third party clinical studies have proven this revolutionary spray provides 24 hour frizz control while it mends 96% of split ends by sealing hair shafts. Plus it is heat activated to provide heat protection to help prevent damage from blow dryers, curling irons and other hot tools. It may also be sprayed on damp hair and left to air dry. Use it for setting, controlling and finishing any style. Start with a very small amount, just a couple sprays and evenly distribute from roots to ends with your fingers – a little goes a long way. Best if applied to damp hair before styling, the Spray may also be used in between washing and conditioning for added lift, volume and hold. How do I use Keranique®? 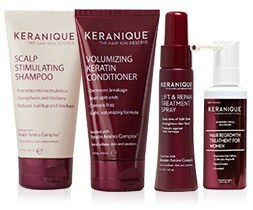 Keranique's complete line of hair-care products can help transform the appearance of your hair. With continued and regular use of the core System in just a few easy steps, nourished, healthier-looking hair can be yours. Simply follow the instructions and directions that are provided on each product label. Is there anything else I should do while using the Keranique® System? We know that you're going to love the results you experience with continued use of Keranique®. Simply use the products as instructed in the directions to see visibly, thicker-looking hair. Your hair will feel silkier and shinier as soon as you start using the Keranique® Shampoo and Conditioner. Your scalp will feel invigorated, and with each use, you will be improving the health of your hair. Hair regrowth takes time and requires patience. Continued use of the Keranique Hair Regrowth Treatment with 2% Minoxidil for at least 4 months is usually needed before you start to notice regrowth. In the meantime, our other products in the Keranique system start working immediately to help repair and prevent further hair damage. With the use of the Keranique Hair Regrowth Treatment with 2% Minoxidil, during the first two months, after beginning the treatment, a small percentage of women may temporarily shed a little more hair than usual. Note that this is part of the process and the slight extra shedding is only temporary; it indicates that the follicles are making way for new, healthier hair growth and that the product is working. Remember to keep using the Hair Regrowth Treatment every day, twice a day, morning and night. Important to note: everyone is different. Some users notice some results in as little as 2 to 4 months, but to see best results, it can take from 6 months up to a year. Once you’ve experienced initial results, you will continue to see improvement in your hair. Should I use Keranique® every day? The Keranique Hair Regrowth Treatment with 2% Minoxidil should be used twice a day, every day. But keep in mind that when using it, using more of it than 1 mL per application or using it more often than the recommended twice daily application of 1 mL will NOT improve results. It may even be counterproductive . However, you can use most of the other Keranique® products every day or every other day, based on what works best for you. Please refer to the Use Directions for guidance. Additionally, we recommend that for best results you use other Keranique® products, as the overall system was created and designed to work together to give your hair the best care possible and give you optimal results. How do I use the Hair Regrowth Treatment with 2% Minoxidil? The Keranique® Hair Regrowth Treatment with 2 % Minoxidil is a liquid that has the consistency of water and should be applied only to the scalp. There are two ways to apply Minoxidil. One delivery system uses a dropper and the second is a sprayer. With the dropper apply 1mL twice-a-day – just a drop or two at a time -- to the areas of concern on your scalp. For the sprayer, after first priming it before initial use by pressing down on the sprayer nozzle a few times, apply 6 sprays twice a day to your areas of concern. Applying it to the scalp, twice daily as recommended, should not affect your hairstyle or make your hair greasy. If applying when your hair is damp in the evening, wait for your hair to dry before going to bed. Always wash your hands and any areas of your face with soap and water if it drips down from your scalp. Is it okay to use the Keranique® Hair Regrowth Treatment with 2% Minoxidil on either permed or color-treated hair? Yes, you can use the Minoxidil on both permed and color-treated hair. We recommend that you do not use Minoxidil on the same day your hair is colored or treated with permanent wave chemicals. How does Keranique® Hair Regrowth Treatment with 2% Minoxidil work? In certain types of hair loss, a combination of heredity, hormones, and age causes a progressive shrinking, or miniaturization, of the hair follicles in your scalp. This can shorten the hair's growing cycle. Over time, as the active growth phase becomes shorter, the resting phase becomes longer. Eventually, there may be no growth at all. Researchers believe that this FDA-approved ingredient works in part by helping to reverse the miniaturization process. By enlarging miniaturized follicles, the growth phase of the hair cycle is prolonged, allowing the hair to become longer and thicker-looking. It may also work as a vasodilator to help stimulate blood flow in the scalp in order to get more nutrients delivered to the follicles. With more follicles receiving more nutrients and more in the growth phase at the same time, it is possible to see improved coverage of the scalp. How do I know that the Keranique® Hair Regrowth Treatment with 2% Minoxidil is right for me? If two or more of these statements are true, you may be experiencing hair loss. Do not use if you have patchy hair loss. This treatment will not prevent or improve hair loss related to pregnancy, the use of some prescription and non-prescription medications, certain severe nutritional problems, the recently discontinued use of birth control pills, low thyroid states, chemotherapy or diseases that cause scarring of the scalp. Nor will it improve hair loss due to damage from the use of hair products which cause scarring or deep burns of the scalp or hair grooming methods such as cornrows or ponytails that require pulling the hair tightly back from the scalp. Do not use if pregnant or breast feeding. Keep out of reach of children. I’ve seen hair regrowth; do I need to continue using the treatment? Continued use of the Keranique® System is needed to maintain your new hair growth. Without consistent application of the Keranique® Hair Regrowth Treatment with 2% Minoxidil, the normal hair loss process will resume in 3 – 4 months. Your hair won’t be worse off than it was before but it will revert back to that thinning state without continued use of the product. 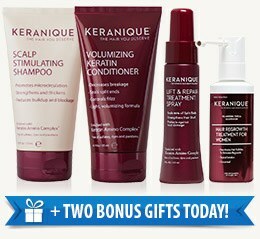 Visible volume and healthier looking hair can be yours with consistent use of the entire Keranique System. What is the difference between the Keranique® Hair Regrowth Treatment and the Follicle Boosting Serum? The Keranique® Hair Regrowth Treatment with 2% Minoxidil features the only FDA-approved ingredient for hair loss that has been clinically proven to regrow hair in women. It’s highly effective and has shown amazing results; however, the Keranique® Hair Regrowth Treatment is not for everyone. Please read the instructions and warning on the packaging carefully before using it for the first time to determine if it’s appropriate for you. The Follicle Boosting Serum was specifically formulated to help visibly improve the appearance of hair thickness while maintaining shiny, healthy-looking hair. The Follicle Boosting Serum is meant for people who can’t or prefer not to use Keranique® Hair Regrowth Treatment for various reasons. The Follicle Boosting Serum contains an award winning ingredient that is a clinical strength patented peptide that helps optimize the hair growth cycle and revitalize your follicles. What will my new hair look like? Early hair growth is soft and colorless, like peach fuzz. With continued use and over time, new hairs should become the same color and thickness as your other hair. If you do not see results after 4 months of twice daily usage applied directly to your scalp in the problem areas, talk to your doctor or dermatologist. Once you see results, you should see continuing improvement for up to a full year after starting to use the System as directed. My hair seems to be dryer and tangles easy; what can I do? Our shampoo removes impurities and buildup, while our conditioner adds body and volume without leaving a heavy, waxy and coated feel on the hair or scalp. If you have dry or coarse or very curly hair, try using our Deep Hydrating shampoo and conditioner formulas or also our Keranique Marula Hair Oil for added moisture. You can also warm the oil and leave it in your hair for a few more minutes as a hot oil treatment. Also try blow drying your hair using a medium to low setting. Minimal itching or dryness may be experienced; however, our shampoo and conditioner moisturize the scalp, so be sure to use these daily if you are experiencing itchiness or dryness. Also, try washing your hair twice instead of just once before conditioning. You may also prefer using our Deep Hydration formulas of shampoo & conditioner. Another product that can help reduce build up on the scalp is the Keranique® Micro Exfoliating Follicle Revitalizing Mask used a few time as week to scrub your scalp clean and condition your scalp and hair as well. Hair shedding at the beginning of the treatment may happen for a small percentage of users, but it’s temporary (usually lasting from 2 – 6 weeks at most), and this can actually indicate that Keranique® is working. So it’s really a good sign. Hair grows slowly – on average hair grows about ½ inch per month. It has to emerge from the follicle before it grows from the scalp, so there will be a short period of 3 – 4 months before you will begin to see a visible difference. As the Keranique® Hair Regrowth Treatment with 2% Minoxidil begins to take effect and regrow hair, it is important to realize that it can also help stop further hair loss by revitalizing and stimulating hair follicles. Can I use the Follicle Boosting Serum and the Keranique® Hair Regrowth Treatment with 2% Minoxidil together? We recommend using the Hair Regrowth Treatment with 2% Minoxidil if your goal is hair re-growth. However, if you are not experiencing hair loss and just want thicker, fuller and healthier hair, then use the Follicle Boosting Serum. How often can I use the Intensive Hair 8 Day Jump Start? You can use the 8 Day Jump Start when you first start the program and also every 30 days thereafter if you like. Use in between the Hair Regrowth Treatment or Follicle Boosting Serum. You can also incorporate it into your hair care regimen once every 60 or 90 days..
How do I use the Micro-Exfoliating Follicle Revitalizing Mask? The mask can be used once or twice per week, as a pre-shampoo treatment to exfoliate the scalp, removing sebum, debris and build-up left behind from styling products. This can help if you feel any dryness or itchiness on your scalp as well. It can also be used daily after shampooing as a deep conditioner. How do I use the Intensive Overnight Hair Repair Serum? Apply 1 ml with dropper directly onto the scalp in the thinning areas at night before bed after having used Minoxidil first and letting it dry for a few minutes before applying the Serum to the scalp. Massage in. Do not rinse. Wash hands after applying. Follow normal hair routine in the morning. Is the Marula Oil Hair Treatment Spray good for thin hair? Yes. It is very light-weight oil dispensed with a micro-fine mist sprayer, specifically formulated for fine or thinning hair. It hydrates, softens, tames flyaways, protects and adds shine immediately to the hair. What is the Keranique® Auto Ship Delivery Program? Keranique® is pleased to offer you the benefits of our Preferred-Customer Auto Ship Delivery Program. This auto-ship program is designed to ensure you always get the products you want, when you want them at special-member pricing. As a member, you will have access to exclusive product offerings, free-trial offers and exclusive pricing. You may cancel your Auto Ship Delivery at any time. Do I have to join the Auto Ship Delivery Program? Membership in the Preferred-Customer Auto-Ship Delivery Program is your choice and you will receive the lowest price when joining. You may, however, buy individual products on a single shipment basis without joining the program as you prefer. Or you can also join the auto ship delivery program at any time to take advantage of special-member pricing and the convenience of automatic deliveries. Can I change the date of my Auto Ship? Absolutely. Our Auto-Ship Program puts you in control. You can change your billing date and even adjust the frequency of your shipments, directly through our online Customer self-service portal or by contacting us via email or by calling Customer service 24/7 at 1-888-237-4131. How do I cancel the Keranique® Auto-Ship Delivery Program? There are three easy ways to cancel your account from the Auto-Ship Delivery Program. Visit our online Customer self-service portal or by contacting us via email or by calling Customer service 24/7 at 1-888-237-4131 and we will cancel your membership immediately so that you do not receive future shipments. What are the benefits of the Keranique® Preferred-Customer Auto-Ship Delivery Program? As a valued Customer, Keranique® is pleased to offer you the benefits of our Preferred-Customer Auto-Ship Delivery Program. This Auto-Ship Program is designed to ensure you always get the products you want, when you want them at special member pricing. • Convenience: After your introductory period, you will enjoy the convenience of automatic, regular deliveries, and the ultimate in savings with members-only prices. You won’t run out of product when you need it. There is no set-up fee, and you can cancel future shipments at any time. • Customization: As a Program Member, you can always customize your hair care system to meet your needs! • Flexibility: Keranique® is committed to ensuring you get the products you want, when you want them. If you want to cancel or speed up or slow down the frequency of your shipments, just let us know. • Member Pricing: Keranique® Auto-Ship Delivery Program members always pay reduced prices on Keranique® products! • Installment Billing: As a member of the Keranique® Auto-Ship Delivery Program, the card you provide at the time you place your order will automatically be charged for your initial shipment and each subsequent auto-shipment, depending on which offer you choose. • Money Back Guarantee (less S&P): If you are not completely delighted with any Keranique® product, depending on the offer you chose, after receipt of your shipment, you can contact Customer service to receive a Return Number. Then return the merchandise as instructed, to avoid being billed or for a refund of the product purchase price (less shipping and processing), even if the containers are empty. We'll typically ship your order within 2 - 3 business days after the date it was placed, based on inventory availability for the products you are ordering. Standard Delivery will arrive within 4-10 business days, as long as the products you’ve ordered are in stock. Your trial starts not when your order ships but when it is delivered and you receive it. Shipping and processing fees may vary and are indicated at checkout. Local and State sales tax may apply. KERANIQUE – Please note that credit card descriptions may vary based on bank. We are so confident that you will enjoy the results of Keranique® that we offer you a Keranique® Money Back Guarantee (less S&P) on our products that varies based on the products you order or the offer you choose. If you're not completely satisfied, simply call Customer service at 1-888-237-4131 after receiving your shipment to request a Return Number. Then return Keranique® within 2 weeks as instructed, even if the containers are empty, to avoid further payments or to receive a refund of any purchase price payments (less shipping and processing). All future shipments will be cancelled. Customer will be responsible for paying return postage. What if my products are damaged or there’s an error with my shipment? • Damaged Products: Product(s) damaged during shipping will be replaced at no charge. Save the package and all contents, and contact Customer Service at 1-888-237-4131 to request a Return Number. • Shipping and Delivery Errors: Should you experience any problems with your order, please contact Customer Service immediately, so that we may correct it in a timely matter. • We highly recommend sending the return back with a certified receipt or delivery confirmation number. • All purchases returned after the return policy time frame has been exceeded based on the offer you choose will receive a store credit good for 12 months from the date of return. • Refunds will be issued to the same credit or debit card to which they were charged. • To ensure prompt processing, returns must be sent to the address provided with your Return Number. We highly recommend sending the return back with a certified receipt or delivery confirmation number. • All purchases returned after the appropriate length of time specified in the return policy provided based on the offer you choose will receive a store credit good for 12 months from the date of return. We will not process or refund packages marked "Return to Sender." • Refunds will always be issued to the same credit card to which they were charged. • To ensure prompt processing, returns must be sent to the address provided with your Return Number. The warehouse cannot accept packages without a Return Number. From the time our warehouse receives your return, it generally takes 5 business days to process your refund. Please keep in mind that the number of days it takes for the credit to post to your account can slightly vary depending on how quickly your bank recognizes and posts our refund. Please allow a few weeks for the refund to show on your statement. Your credit or debit card will be refunded by Keranique.